Oh yes, yes, yes, just in time for the winter gardening book list, just in time for Blizzard Sundays (as we call any winter day in Minnesota where you’d go cross-country skiing if the snowdrift on the other side of the door would allow you), just in time to ease my cynical mind and callous heart, and just in time for Christmas: A new book by gardening’s Godfather, Ken Druse. What a great gig. Here, Ken, come up with a list—a long list—of the plants you grow, cherish, and admire, then write a book—a big book—with captivating stories about their history and development, their use and care, their blatant beauty and dirty little secrets. And while you’re at it, shoot the photos as well, hundreds of them, since your eye with a camera is equaled only by your wizardly way with words. Am I gushing? Yes. For a garden writer, reading Ken Druse is like a sixteen year-old guitar player watching Eric Clapton in concert. The pace is impeccable, every note is perfect, and jeez Louise, how did he just do that? Tales from Ken’s earliest childhood memories of his mother’s garden are juxtaposed seamlessly with tales of Captain James Cook in the 1700s. Or you may find yourself back 10,000 years, visiting our ancestors while they start domesticating livestock and cultivating the grasses to feed them. Within a few pages you meet Pythagoras, the ancient Greek philosopher; Fibonacci, the 13th-century mathematician, and of course, Leonardo da Vinci—scientist, painter, draftsman, engineer, inventor. What do they have in common? Your garden. 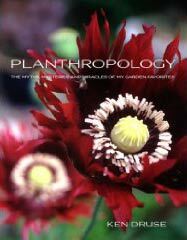 As compelling as a crime novel, Planthropology just so happens to dispense more useful gardening wisdom along the way than half the books on my shelf. Whatever the topic—garden art, fragrance, bloom color, pests, pruning, propagation, design, bees, butterflies, several dozen more—Druse’s great gift as a writer has always been foremost that the reader not only learns, but learns in proper context, his words a loving and playful kick in the pants toward lasting appreciation. Only time bestows the mantle of classic, but I sense I hold a classic in my hands.